Who Almost Nabbed Goldblum's Role in 'Jurassic Park'? 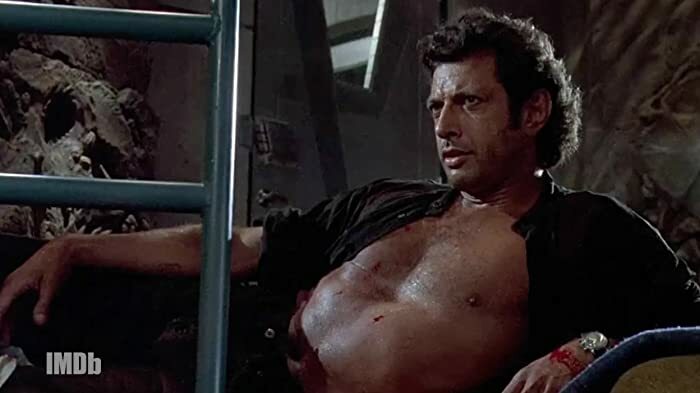 Jurassic Park without Jeff Goldblum is like a night without stars. But was Johnny Depp close to landing the role of Ian Malcolm instead? We investigate in this episode of "Casting Calls." Another 37 wins & 26 nominations. | A Spielberg Cult Classic Film and a great science fiction action adventure film of all time. Jurassic Park is a 1993 American science fiction adventure film directed by Steven Spielberg. It is the first installment of the Jurassic Park film series. It is based on the 1990 novel of the same name by Michael Crichton, with a screenplay written by Crichton and David Koepp. The film centers on the fictional Isla Nublar, an islet located off Central America's Pacific Coast, near Costa Rica, where a billionaire philanthropist and a small team of genetic scientists have created a wildlife park of cloned dinosaurs. Jurassic Park is the second Steven's Spielberg Classic cult Film. A great science fiction/action/adventure film. This film is great edge of your seat action sequences. It has a wonderful cast with wonderful performance of their characters. John Williams music score is excellent the same like is in Indiana Jones films. Beside Raiders of the Lost Ark is the second Best classic movie in the franchise. Jurassic Park (1993) was nominated for 3 Academy Awards for Best Sound, Best Effects, Sound Effects Editing and Visual Effects. I love this film to death! It is been 22.years since we got this awesome adventure dinosaurs flick. I know a couple of friends of mine that love this film including me. It is a cult classic film and It has a heart. We have Tyrannosaurus Rex chasing the group, Velociraptors chasing Tim and Lex after they are reaching the visitor center and they are in inside the main kitchen. Dilophosaurus killing Nerdy. We also have Triceratops in it and Brachiosaurus. They are other dinosaurs used in the film: Gallimimus, Parasaurolophus and Alamosaurus they both had a cameo scene in it. The special effects creating the dinosaurs by Stan Winston are FANTASTIC! The dinosaurs were created with groundbreaking computer-generated imagery by Industrial Light & Magic and with life-sized animatronic dinosaurs built by Stan Winston's team. To showcase the film's sound design, which included a mixture of various animal noises for the dinosaur roars, Spielberg invested in the creation of DTS, a company specializing in digital surround sound formats. Stan Winston and his team did a great job animating live Dinosaurs on a screen. Steven Spielberg did a wonderful job directing this film, it is definitely my second best childhood film from Steven Spielberg. The first best film would be Raiders of the Lost Ark (1981) which I love this film to death. The screen play written by Michael Crichton and David Koepp did a great job and the plot of the film was just awesome. The plot: During a preview tour, a theme park suffers a major power breakdown that allows its cloned dinosaur exhibits to run amok. The crew cast all did a wonderful job of acting. The acting of this film was terrific and believable. Sam Neill as Dr. Alan Grant, a leading paleontologist did a wonderful job portraying his character. He act the character like he was written on his skin. Laura Dern as Dr. Ellie Sattler, a paleobotanist. did a wonderful job like how she cared about an ill Triceratops. I was really surprised how the character cares about an ill dinosaurs that she barely know and she wanted to help him was out stating! Laura Dern for me in this film was a heart and a key watching this film of how a good hearted person she is. Jeff Goldblum as Dr. Ian Malcolm, a mathematician and chaos theorist was really good in his acting and his character. Richard Attenborough as John Hammond, InGen's billionaire CEO and the park's creator was awesome playing his character. It is really a shame Richard Attenborough died last year and he isn't with us anymore. Ariana Richards and Joseph Mazzello as Lex and Tim did a wonderful job portraying John Hammonds grand children. I didn't know Samuel L. Jackson was in this film I really didn't know that. The whole cast was awesome in here. Music by score by John Williams is fabulous and fantastic I always love this song to death. There is everything in this film I love. How Dr. Grant, Lex and Tim are fighting to survive when they are trapped alone in the park. How tough and strong they are they don't panic and screaming they are fighting to come back save home. Lex and Tim are cornered by a pair of raptors inside the main kitchen. In one of the most terrifying scenes in the entire film, the raptors stalk through the dark kitchen, searching for the kids. 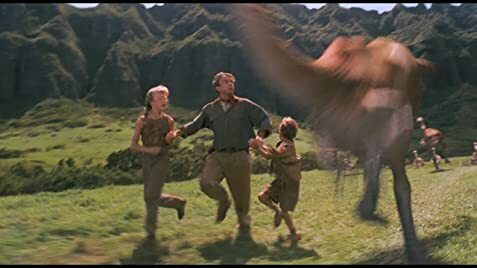 Eventually, Lex and Tim manage to lure one of the raptors into the freezer and lock it in, but the other raptor chases them out of the kitchen. The scene was the most memorable to me and terrifying. Another terrifying scene is when Ellie discovers Ray's severed arm in the maintenance shed and she sees the raptor that eat Ray try's to eat her, that also scared me a lot. After the power was cut off on the electric fences and the kids with Alan are climbing over the fences and the power is turn back on by Ellie and Ray the fence electrifies Tim and he fly's down off the fence. The scene was awesome but also terrifying and real. I'm not sure what else you would want in a movie like this?! It is a perfect 10. I love this film to death! I love this film to death!! The action sequences are also awesome, the plot, the cast everything is great about this film. This movie and the book generated so much interest in dinosaurs that the study of paleontology has had a record increase in students. Worker in Raptor Pen: Everybody, heads up! Heads up! Keep clear! Keep it clear! Okay, down! Andale, si! Vamonos. Keep it goin'! Come on! That's good, stay! Slow it down. No lo vayan a tirar! Cuidado! Traigala, traigala! Muldoon: Okay, pushing team, move in there. While Lex and Tim are hiding in the kitchen, when the large serving spoon falls it cuts to the closeup of the two Velociraptors and the tall shelving unit has vanished, but in the next shot when the one of the raptors leaps onto the counter that tall shelving unit is back. The credits are in a jungle typeface. In 2013, the film was re-released in 3D. In this version, the newer Universal logo is used at the opening of the film.